When contemporary Chinese artworks were first introduced to international art auctions, they were highly marketable as novel, exotic and most importantly, politically charged. Although prices for western art in the global market had begun to decline by the early 1990s, Chinese art sales at international auctions continued to escalate and reached unprecedented heights in the early 2000s. As early as September 1991, Christie’s Hong Kong had sold a melancholic portrait of a man and woman by the 27-year-old Liu Xiaodong for a respectable HK$71,500. Liu Xiaodong’s success demonstrated that even experimental artists who were younger and less established at the time could find commercial success in the international market. Nevertheless, Debevoise asks whether the art market, which once had the capacity to liberate artists from the constraints of the state, has become the new authority? While this was not the case for all Chinese artists, market demand and foreign taste informed the artwork of certain artists especially Wang Guangyi. Even today, Wang has replicated paintings from the Great Criticism series (fig 4, 5) with only minor variations to create a series of “collectible” artworks for the art market. These iterations continue to feature poster- like paintings in the style of Mao-era propaganda superimposed with international consumer logos. 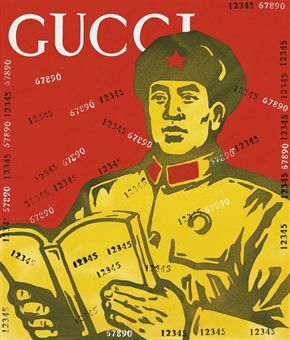 For instance, Mass Criticism-Gucci (fig 5) depicts a stoic soldier in a typical Mao-era cap and jacket holding a book with “GUCCI” plastered across the top of the painting. Like a good luxury Italian leather handbag, this painting caters to Euro-American demand by being a recognizable brand with a relatively predictable price valuation. This artwork explicitly links the realms of luxury goods, art and also Chinese culture into one product. Not only does the buyer get to associate him or herself with a celebrity artist, the buyer essentially purchases a badge asserting their sense of elite taste and knowledge of Chinese history and politics. Furthermore, Wang’s artworks appeal to Euro-American collectors because they express what looks like politically charged subject matter rendered in a style analogous to American Pop art. As a result, Wang’s paintings are readily legible to a western audience. Wang was fully aware that after Deng Xiaoping officially ended China’s isolation period, a politicized image of Chinese art was just what many in the West were waiting for. Through a reductive reading, Wang’s Great Criticism series could be treated as making fun of communism and aligned to a capitalist world-view making these Political Pop paintings entirely compatible with the American triumphalist ideology of global leadership. The Chinese art world understood Wang’s original intentions in creating artworks that stimulated conversation but did not overtly attack the Chinese government. By comparison, western critics were ignorant of the intellectual complexity of Chinese experimental art forms from this period and even caricatured their ambitions. Western media and news reports of China’s developments have centered (and capitalized) on an exaggerated view of the polarization of the state’s interests and the people’s needs. These skewed reports serve to proclaim the harmony and health of American democracy. Popular western media has fixated on politics and references to Tiananmen Square, branding Wang’s art as “dissident.” In Time magazine’s February 1993 issue, Sandra Burton writes, “Call it post-Tiananmen Pop or Cynical Realism, the imagery of main land Chinese dissidents is poised to become the hottest thing on the Hong Kong art market.” Following the debut of Mao Zedong AO at China|Avant-Garde in 1989, a similar incident happened when Time magazine judged the meaning and value of this painting based on inappropriate western ideas and values. This is problematic because as Clarke has pointed out, the look of dissidence can be commoditized for the western marketplace like anything else. Thus what looks political or “dissident” in Chinese art may not be. Nevertheless, misinterpretations propelled by western media erroneously insinuate non-existent anti-institutional connotations in Chinese artworks in order to assert the superior quality of American life. Although Wang is still considered the poster boy for Political Pop, he was far from the stereotypical image of the persecuted dissident cemented in the western mindset. In fact, Wang was well aware of the political myth and he was intent on exploiting it to gain market appeal. This provoked Chinese critic and curator, Hou Hanru, to criticize Wang for catering to the Western public’s taste for artworks that confirm their own western ideological superiority. Wang had successfully subverted recognizable political and commercial icons to create meaningless paintings onto which the viewer could attach his or her own myths. Knowing that the art world was no longer just for art lovers and that it was quickly becoming a global social club for the mega rich, Wang was fully intent on becoming a part of it. Political Pop became the most recognized art form outside of China because it offered western media a form and substance they thought they understood. Artworks in this category are connected by a common use of bright colors, a flattened visual representation reminiscent of posters, and a recurrent appropriation of Cultural Revolution-era iconography. Viewers outside of China, however, have based their perceptions of contemporary Chinese art on a misleading emphasis on binaries, such as “official” and “unofficial” art. These terms developed in the international art world in the 1980s, but they crystallized after the events at Tiananmen Square. An emphasis on the “unofficial” to describe experimental Chinese artists has lead to the disingenuous categorization of all experimental art as “dissident.” However, the majority of Chinese artists discussed by the international art world, regardless of medium or form of expression, were educated and employed by the state and worked within or on the margins of the mainstream cultural establishment in China. Although state authorities have always kept an eye on experimental artists to an extent, the line between official and unofficial art has never been distinct. Prices at auction for Chinese art continued to climb because westerners were so intrigued by what they thought were the “rebellious” artworks of “unofficial” artists. It becomes clear that international consumers of contemporary Chinese art wanted to own a piece of what they thought symbolized China’s energy and intellect. Thus in 2006, Sotheby’s New York organized the first auction devoted to contemporary Asian art, Contemporary Art Asia: China Japan and Korea. The international attention and immediate fame from this auction made it a milestone for contemporary Chinese art, which has since continued to represent the majority of total contemporary Asian art sales in the market. In the auction room at Sotheby’s New York, a 1998 painting by Zhang Xiaogang (fig 6)sold for just over US$1 million, making it the first work by a living Chinese experimental artist to reach such a market breakthrough. Part of the Political Pop movement, this painting belonged to Zhang’s signature Bloodline series and depicts a somber-toned portrait of a young man dressed in a Mao jacket, reminiscent of the portraits taken during the Cultural Revolution. Soon after news of Sotheby’s success hit global headlines, the rapid ascent of prices at auction thereafter and recognition by the international art world of identifiable signature artworks confirmed that the market was red hot for contemporary Chinese art. After the international stock market crashed in September 2008, however, the mood in the art market changed. In the art world, dire predictions in the news about the negative impact of commerce on contemporary art worldwide quickly replaced articles about skyrocketing prices. In the west, Julian Stallabrass criticized Damien Hirst and his fellow Young British Artists for submitting to the logic of art as commodity, reducing their art to a commercial logo and a sales figure. He condemned these artists for offering shock tactics and controversy to exploit the value system of a capitalist consumer class without ever challenging that system. Describing the artwork of Hirst, Jeff Koons and Takashi Murakami, Hal Foster wrote: “the market is the very medium of the art.” He observed that the confusion of positions and values, of “artistic and commercial, high and low, rare and mass, expensive and cheap,” which was once the power of these artworks has “imploded” and all tension has been lost.The same could be said about much of the Chinese Political Pop art and its many derivatives. According to Debevoise, these artists were accused for “cranking out for foreign consumption iconic images construed in the mainstream consciousness as typically and recognizably Chinese.” These iconic images include red stars, red flags, and other motifs that symbolize Mao and the Cultural Revolution. Annual reports of top-selling artists at auction reveal that contemporary Chinese artists who have ranked high on these lists are consistently artists whose artworks contain symbols and motifs recognized by the west as being “Chinese.” The repetition of these similar-looking images published in mainstream magazines and newspapers delimits the international art world’s understanding of both contemporary Chinese art and Chinese culture. In reaction to the development of signature styles and the widespread repetition of stereotypical images, Wang Guangyi and other contemporary Chinese artists who have found success on the global market have been accused of clinging to “successful formulas.” These “formulas” refer to the various series of artworks including Wang’s Great Criticism and Zhang’s Bloodline series, reproduced over and over again by artists because of their guaranteed commercial success. However, Wang is an extreme example of an artist who has exploited the myth of the Chinese artist to his advantage. Because western scholars, including Smith, have called Wang’s artwork the “most memorable image embodying the spirit of the Chinese avant-garde,” others have made assumptions about his commercial agenda and the entirety of contemporary Chinese art. Despite the brief downturn in contemporary Chinese art sales following the market crash, investor confidence returned and by 2010, prices at auction for this body of art resumed their climb. This time, it was clear that both international collectors and artists wanted to exploit the profit-making potential of contemporary Chinese art. Although the low estimate for Wang’s paintings at auction can easily reach US$50,000, Wang has also strategically produced a set of less expensive edition prints in order to expand his market reach. In an article from Artnet News, “5 Chinese Artists Every Collector Should Own,” readers are encouraged to purchase Wang’s prints as an “ideal starting point” in building a contemporary Chinese art collection because “the easy-to-trace provenance of his prints offers security for new investors who would like to re-sell his works fairly quickly.” This blatant interest in art as an investment confirms that market confidence in contemporary Chinese artworks directly impacts their reception in the international art world.